For the winter edition of Edible Idaho I discovered a tea shop I’ve passed a hundred times for the first time. Photos by Guy Hand. Some might think that tea comes in one variety – black. A bag extracted from a crispy white envelope and suspended in boiling water by a cotton string with a paper tag attached. Work your way to the back of the shop and survey the brushed metal tins magnetically adhered to the wall, separated in categories like black and green; white and mate. The glass windows and flavor tags on each give a hint to the contents inside. Remove a tin, twist open the lid and fill your nose, and your head, with the rich aromas. 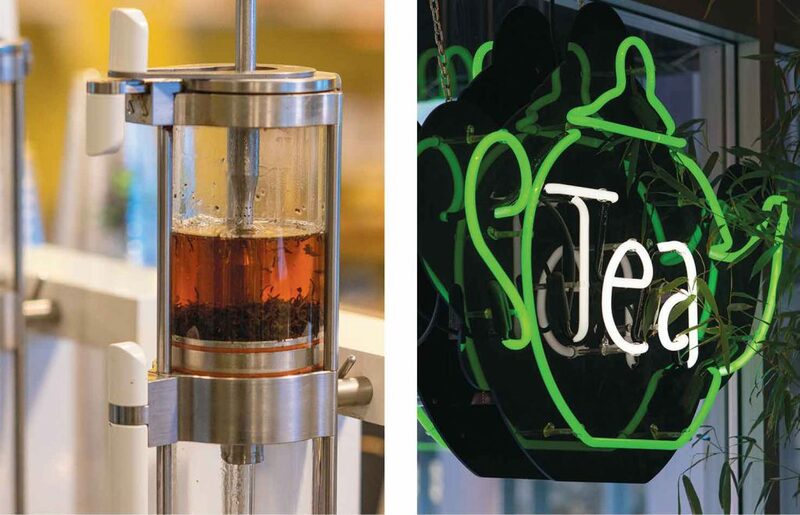 With 120 tea options, they’ve undoubtedly seen more than one person’s eyes glaze over but don’t worry. The staff is well trained to spot the signs and help customers navigate the options. Mike and Sue Neal opened Snake River Tea in December of 2014. Despite moving back to Boise from a city known for its coffee, Sue had her sights set on tea. “I think people are trying to live a healthier lifestyle and tea fits right in there”, she says. Neal’s daughter, Ally Ryan, got on board and together they started attending trade shows and classes focused on teas. Ryan, the general manager, is also the mixologist of the shop, creating popular blends like the herbal Spa Day, Roasted Honey Maté and their House Blend Chai. The teas are all bulk and can be purchased in any quantity to make at home. Some of the most popular flavors are bagged in two- and four-ounce packages ready to grab and go. Even with all these choices the number one seller is still English Breakfast, but Ryan is quick to add, “People in Boise love their coconut – Coconut Chai, Coconut Oolong, Coconut Maté”. Teas are swapped out seasonally. Look for Holiday Gingerbread, Winter White Chocolate Mint, Peppermint Frost and Christmas Brew throughout the colder months. If ever in Boise, I’ll definitely check that place out. I’m a lifelong tea drinker since about the age of two, drink black loose leaf tea about 8 times a day! For sure Jean. The tea shop is amazing and right downtown. Thanks for the comment and have an awesome day!